On November 22, CMHA Sault Ste. Marie joins communities and organizations across the country to mark National Housing Day and recognize the challenges faced by many people in finding a place to call home. In partnership with other stakeholders, CMHAs continues its efforts to promote the need for housing in general and supportive housing in particular for people with lived experience of mental illness. CMHA Sault Ste. 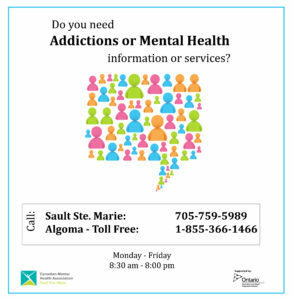 Marie offers the Housing Support program, as well as the Central Access and Information service, where you can speak with an Access Worker who will be able to provide you with information and referrals to the housing, mental health and addictions services that are available in the Algoma District.